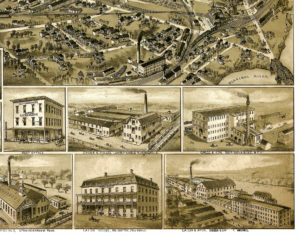 This is Nashua, New Hampshire in 1883. The town and birth place of Wilfred F. Langelier. The town was named after an indigenous tribe called the Nashaway. Nashua is also hometown of the famous photo-copiers, the same copiers that save us money, save time and put us first. The hero of this short blog, was born in 1886. His first degree was a B.Sc., in chemistry which he obtained from the University of New Hampshire in 1909. He then went to the University of Illinois, where he earned an M.Sc., in 1911. For the next half decade he worked in the Illinois State Water Survey department. In 1916 he was approached by the Professor of Sanitary Engineering at Berkeley University, California. It was at this famous West Coast institution that Wilfred, soon to be Professor Langelier, would spend the rest of his working life. Today his work is widely known via the Langelier saturation index for the measurement of corrosive potential of potable water in pipes and plumbing. This seminal contribution was first published in the 1936 edition of the Journal of the American Water Works Association. What is the Langelier saturation index for measurement of corrosion? The Langelier Index is a number that if negative describes a corrosive water. If positive, a scale forming water. The ideal water, one that is neither corrosive or scale forming will have a Langelier index very close to zero. Calculation of the index requires measurement of conductivity, alkalinity, calcium content and pH. The index is also influenced by temperature, so this too needs to be measured. Calculation of the index is at first glance quite simple. It is the pH of the water sample minus the calculated saturation pH of the water. If the pH of the water is close or equal to the saturation pH, the index is zero. Calculation of the saturation pH is a function of the various parameters mentioned above. In broad brush strokes, the saturation pH is the point at which water is unable to absorb any more ions or salts. If the water is completely devoid of ions and salts, the potential to absorb is great. Conversely, if the water has ions and salts in plenty, the scope for further absorption is limited.